The record is made up of 1 file (171 folios). It was created in 30 May 1932-16 Jul 1934. It was written in English. The original is part of the British Library: India Office The department of the British Government to which the Government of India reported between 1858 and 1947. The successor to the Court of Directors. Records and Private Papers. Khor-al-Odeid on the east side of the^Peninsula. H.M. S.’’Bidef ord n , paid a visit to the Sheikh of Q,atar. The file contains correspondence, memoranda, and reports relating to two topics. The first topic is an attempt by the British Government to obtain permission for an emergency landing ground in Qatar during 1932. The second topic relates to the air facilities needed by the Royal Air Force (RAF) in Qatar, if an offer of British protection is to be made to the Shaikh of Qatar in return for an oil concession for the Anglo-Persian Oil Company (APOC). 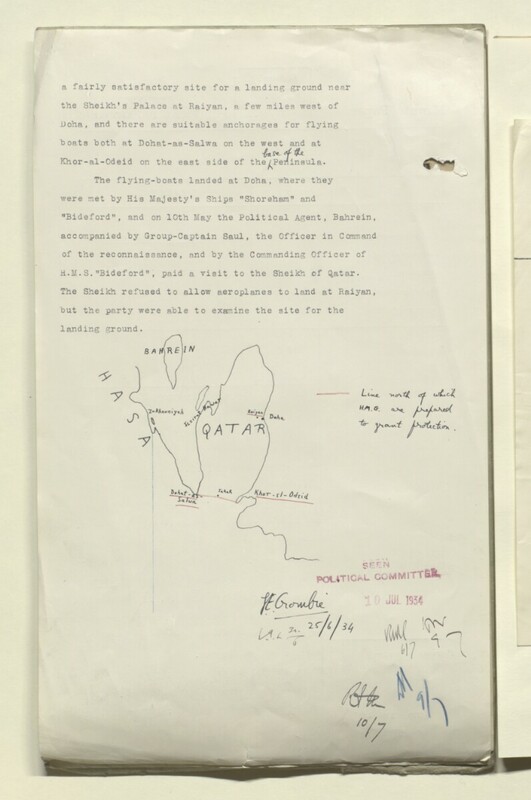 In respect of this second topic, the file also contains material regarding a reconnaissance undertaken by the Royal Air Force over Qatar on the 9 May 1934 to identify suitable sites for such facilities. It includes a copy of a report on the reconnaissance – submitted by Bomber Squadron No 84, Shaibah, Iraq – on folios 27-32, along with a tracing of Qatar (folio 7) and a number of aerial photographs (folios 8-22) referenced in the report. A draft copy of the Qatar Oil Concession can be found on folios 93-101, and notes of amendments proposed by the British Government can be found on folios 80-89. In addition, a number of India Office The department of the British Government to which the Government of India reported between 1858 and 1947. The successor to the Court of Directors. memoranda have also been included towards the back of the file: El Qatar, 1908-16 (folio 167), The Trucial Coast The historic term used by the British to refer to the Gulf coast of Trucial Oman, now called United Arab Emirates. Chiefs, 1908-28 (folios 168-71), and a Précis of the Treaties and Engagements between the British Government and the Chiefs of the Arabian Coast of the Persian Gulf Historically used by the British to refer to the sea area between the Arabian Peninsula and Iran. Often referred to as The Gulf or the Arabian Gulf. (folios 164-67). The main correspondents are as follows: the Political Resident A senior ranking political representative (equivalent to a Consul General) from the diplomatic corps of the Government of India or one of its subordinate provincial governments, in charge of a Political Residency. in the Persian Gulf Historically used by the British to refer to the sea area between the Arabian Peninsula and Iran. Often referred to as The Gulf or the Arabian Gulf. (Trenchard Craven William Fowle), the Foreign Secretary to the Government of India, officials of the Air Ministry, and officials of the India Office The department of the British Government to which the Government of India reported between 1858 and 1947. The successor to the Court of Directors. .
Foliation: the foliation sequence commences at the inside front cover with 1, and terminates at the inside back cover with 173; these numbers are written in pencil, are circled, and are located in the top right corner of the recto The front of a sheet of paper or leaf, often abbreviated to 'r'. side of each folio. A previous foliation sequence, which is also circled, has been superseded and therefore crossed out.